A while back I mentioned a meatball sub from Togo’s in a post, dismissing it as “not worth discussing.” And that remains true, but as I sat down to this number I tried to think if I’d ever had a genuinely bad meatball sub and I couldn’t remember a single one. The Togo’s one may not have been notable in any way, but it wasn’t bad. The last time I talked about meatball subs here I asked if there was any sandwich that better exceeded the sum of its parts, and I’m inclined to think there is not. There’s something magical about an honest meatball and a bit of sauce that always hits the spot. This one was scarcely more than that, just some meatballs, sauce, and a bit of parmesan. A few slices of provolone would have really put it over the top, but even absent that it was a tasty, tasty sandwich. Sometimes the meatballs themselves cause an issue, if they’re substantial and firm they can get a bit tough to handle. Paradiso went about solving that problem by taking a knife to them before loading the sandwich, allowing the chunks of meatball to settle to a more manageable level. Going too far in this direction can leave your sandwich more sloppy joe than sub, but things stayed within reason here. 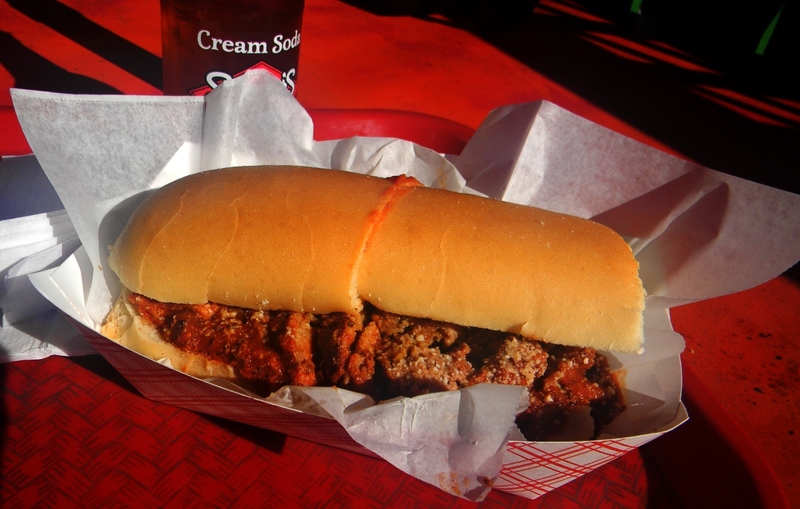 Thinking about it further, I’m not sure I’ve ever had a truly great meatball sub. From the floor/ceiling perspective it’s a very high floor, as your average meatball sub is likely to be pretty good. But I’m not convinced the ceiling is much higher than the floor, as it seems that the flash of beauty the simple combination produces can only shine so bright. That is no great sin, though, not every sandwich need light up the heavens. Sometimes we just need a tasty number on a sunny afternoon, and that was exactly what I got from Paradiso. This entry was posted in Sandwich Reviews and tagged Beef, Reviews by Pete, San Jose, Sandwiches I Have Eaten, Sandwichs Made For Me by Pete. Bookmark the permalink.